VIP Gauge by Vista Industrial Products, Inc. When VIP opened in 1956 as a precision sheet metal and machining shop, our objectives were simple: to provide a quality product on time at a reasonable price. Along with our expertise in metal fabrication and the constant drive for efficency and innovation, we have developed a product that we can benefit from as well as other metal fabricators. 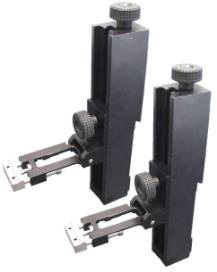 Vista Industrial Products, Inc. has developed a high quality, rugged press brake backstop gauge finger with micrometer adjustment. This tool has been production shop tested for nine years and has proven to reduced setup time with increased accuracy. We now offer this great product to engineers and other metal fabricators! The VIP Gauge can also be customized by adding VIP Gauge fingers for multiple step operations! Using a 4-foot up-acting press brake with 8 VIP Gauge fingers, these parts are produced complete in one handling. Fewer handlings mean better time and motion efficiencies. Parts can be inspected and the next operation started immediately without waiting for all 1000 parts to run through a partial-bend sequence. Precision adjustments can be made quickly with the micrometer wheel. No need for metal or masking tape shims. If you would like to learn more or to purchase a VIP Gauge, please visit www.VIPGauge.com.